The New York Times’s Randy Kennedy finally provides an inkling of the real story beneath the struggle over the Detroit Institute of Arts’s collection. To recap, the city bought much of the art contained within the museum. The region is eager to keep a world class museum. The surrounding counties have responded with alacrity by footing the museum’s operating costs with local taxes. The only remaining issue has been how to help the City of Detroit realize the gain in value from the art it purchased without actually selling the art. This, not a philistine distaste for art as so many critics have leapt to assume, has been the real issue. Although it is never ideal for a museum’s collection to be treated as financial asset, the situation was created long ago. The new proposal would ask the state to begin providing substantial funding to the museum that would allow the museum to provide money to the city that might otherwise be found only by selling art. 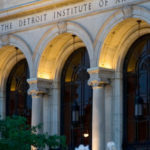 At a business luncheon on Thursday in Detroit, Mr. Orr said that the museum might consider long-term leases of art works as another way of avoiding any sale. “I’m deferring to them to save themselves,” he told business leaders, referring to the institute. Rhodes to Creditors: Get Off the Art!